You know, I'm such a sucker when it comes to sheet mask. I love to try new brand and new kind of mask. 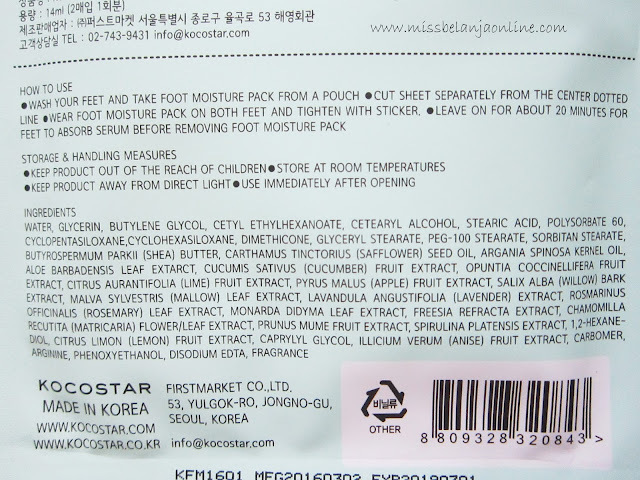 Few weeks ago, I received a foot mask from Kocostar to try along with their slice mask sheet and also flower mask sheet. I've tried foot mask before from another brand, but this time the mask is slightly different with the one that I've tried. Curious? The product's name is Kocostar Foot Moisture Pack. Packaging: I love the packaging color, it is a mint green color and doff material. The direction on the back of the packaging is in english so I can understand it better. To Use it: rip the big mask from the center line and put in on your clean foot, secure with the tape. Wait for 20-30 minutes. After that, remove the mask sheet~ and walaaa~ my foot become super moist and smells good! hehehe. I personally love this mask as it can moisturise my dry foot, plus I still can walk around the house (make sure you use sandals) and do another things. Go to Korea Buys to buy this mask!